This Genuine 30 pin USB cable connects your iPhone, iPad, or iPod to your Mac or Windows PC' USB port for syncing and charging. Use this cable to connect to the Apple USB Power Adapter for convenient charging from a wall outlet. IPod nano 1st Generation, iPod nano 2nd Generation. iPod nano 3rd Generation (video), iPod nano 4th Generation (video). iPhone 3G, iPhone 3Gs, iPhone 4, iPhone 4s. iPod nano 6th Generation, iPod touch 1st Generation. This 100% Genuine Apple 30 pin USB cable connects your iPhone, iPad, or iPod to your Mac or Windows PC' USB port for syncing and charging. Use this cable to connect to the Apple USB Power Adapter for convenient charging from a wall outlet. 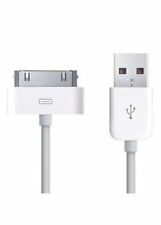 USB cable connects your iPhone, iPad, or iPod to your Mac or Windows PC' USB port for syncing and charging. Use this cable to connect to the Apple USB Power Adapter for convenient charging from a wall outlet. 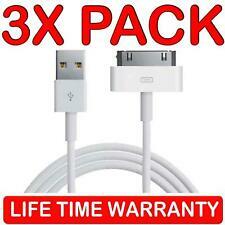 100% Genuine Apple USB Sync Data Cable for iPhone 4/4s. This apple 30 pin USB cable connects your iPhone, iPad, or iPod to your Mac or Windows PC' USB port for syncing and charging or to the Apple USB Power Adapter. iPhone 2G/3G/3GS, iPhone 4,iPhone 4S. iPod Touch, iPod Classic, iPod Mini, iPod Nano. IPhone 1st / 3G /3GS /4/4S/4GS, iPad 1 / 2/ 3, iPod Video U2 Special Edition,iPod Touch 1st /. 2nd /3rd /4th,iPod Nano 1st / 2nd /3rd / 4rh / 5th /6th Gen, iPod Classic 120GB / 160GB / 80GB / 160GB(lunched Late 2009),iPod 4th Gen / U2 Special Edition. Review Apple. Compatible For Apple iPad 1, 2, 3; iPhone 3G, 3GS, 4, 4S; iPod (4G, 5G); iPod classic; iPod 5G; iPod classic; iPod nano (1G, 2G, 3G, 4G, 5G, 6G); iPod touch (1G, 2G, 3G, 4G). IN THE BOX. 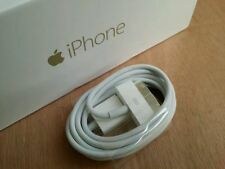 Apple 5w Usb Power Adapter for Apple iPhone MD810LL/A. 5 Watt USB Power Adapter Cube. Genuine Apple Accessory. Compatible Model For Apple iPhone 4. Compatible Model For Apple iPhone 5. Compatible Model For Apple iPhone 3G. IPhone 3G, iPhone 3Gs, iPhone 4, iPhone 4s. 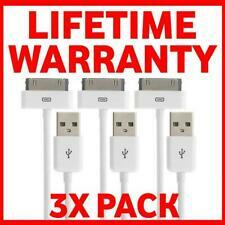 This 30 pin USB cable connects your iPhone, iPad, or iPod to your Mac or Windows PC' USB port for syncing and charging. Use this cable to connect to the Apple USB Power Adapter for convenient charging from a wall outlet. IPhone 1st / 3G /3GS /4/4S/4GS, iPad 1 / 2/ 3, iPod Video U2 Special Edition,iPod Touch 1st / 2nd /3rd /4th,iPod Nano 1st / 2nd /3rd / 4rh / 5th /6th Gen, iPod Classic 120GB / 160GB / 80GB / 160GB(lunched Late 2009),iPod 4th Gen / U2 Special Edition.